When I went this year I really tried hard to keep from just buying all of the books because my shelves at home are currently buckling under the pressure of so many unread books. I tried to limit myself to books I really really really wanted, the second books in series where I’ve read the first one and those where the authors were there for a signing. I’m quite proud of myself because I actually could’ve bought a lot more than I did. The only reason I have quite a few this year is because at the HarperCollins booth they had books for super cheap! I mean hardcovers were $3, softcovers were $1 and so on. Over half of my haul came from the HarperCollins booth lol. Well instead of giving more excuses I’m just going to move right on to the books. 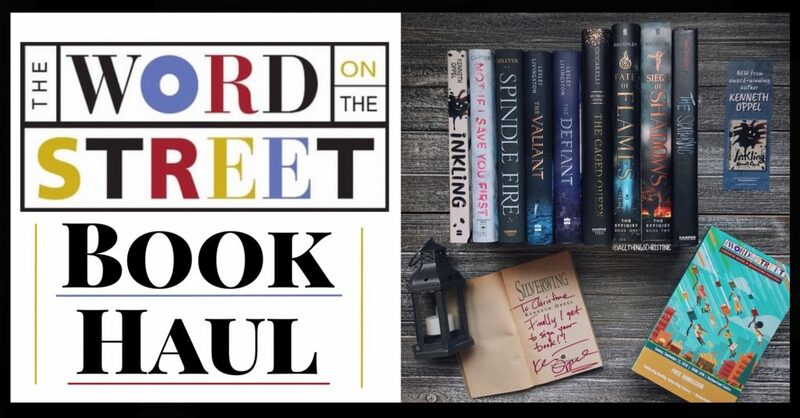 Also, if you want to read my post about Word on the Street 2018 you can see it here. The Rylance family is stuck. Dad’s got writer’s block. Ethan promised to illustrate a group project at school—even though he can’t draw. Sarah’s still pining for a puppy. And they all miss Mom. So much more than they can say. Enter Inkling. 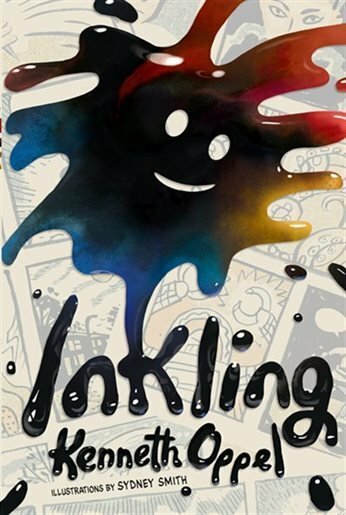 Inkling begins life in Mr. Rylance’s sketchbook. But one night the ink of his drawings runs together—and then leaps off the page! This small burst of creativity is about to change everything. Ethan finds him first. Inkling has absorbed a couple chapters of his math book—not good—and the story he’s supposed to be illustrating for school—also not good. But Inkling’s also started drawing the pictures to go with the story—which is amazing! It’s just the help Ethan was looking for! Inkling helps the rest of the family too—for Sarah he’s a puppy. And for Dad he’s a spark of ideas for a new graphic novel. It’s exactly what they all want. It’s not until Inkling goes missing that this family has to face the larger questions of what they—and Inkling—truly need. 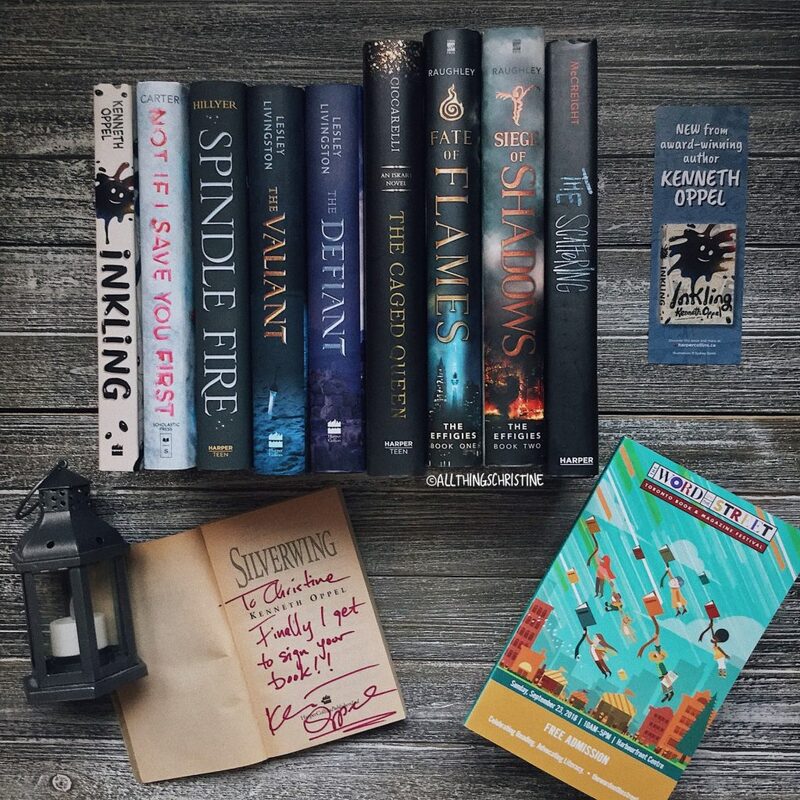 I have been trying to meet Kenneth Oppel ever since I was around 11 years old and read his book Silverwing as part of the Silver Birch reading program. He come every year to Word on the Street in Toronto and I have been multiple times but I just never seemed to be able to meet him. So I was determined to make this year the year I would! First I went to his panel where he did a reading from his new book Inkling and the illustrator drew some images from the book. When he had his signing afterwards I was interested in his new book so I picked up a copy of that while I was there and finally got my copies of Silverwing and Sunwing signed! I am so happy that I finally got to meet him; his books have been a favourite ever since I was a child and he is a lovely person in real life. When I went to the HarperCollins Canada booth they had two sides, the first side had new releases for 30% off and the second side that had older releases for between $1-$5 per book. 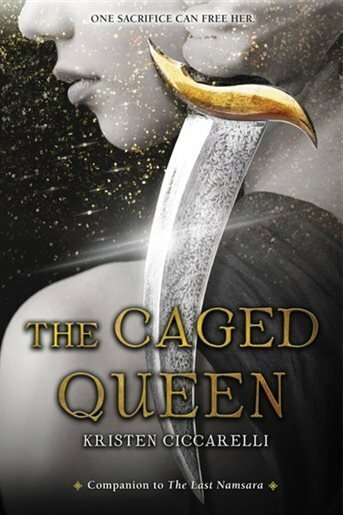 I grabbed The Caged Queen from the new releases table because I read the first book The Last Namsara this year and loved it. You can read my review on The Last Namsara here. This is described as more of a companion book but I loved this dragon filled world and wanted to read more about it. And since this was a sequel where I had read the first book I allowed myself to pick it up guilt free. 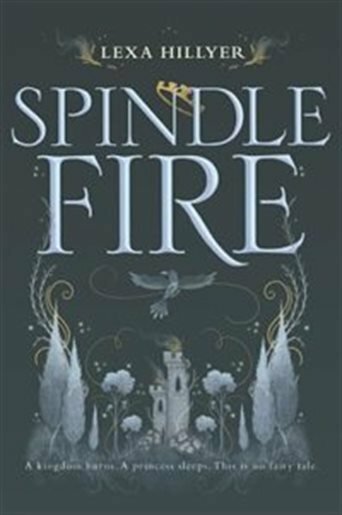 Spindle Fire was a book that was at the discounted part of the HarperCollins Canada booth and I got a hardcover copy for just $3! I’ve heard some pretty mixed reviews about this book but it has been on my radar for awhile and for so cheap I figured I would just grab it and check it out for myself. It sounds like a different take on Sleeping Beauty and I love the Faerie aspect of it so I have high hopes. It sounds like something I would really like and how can you not fall in love with that cover! Fallon is the daughter of a proud Celtic king, the sister of the legendary warrior Sorcha, and the sworn enemy of Julius Caesar. When Fallon was a child, Caesar’s armies invaded her homeland, and her beloved sister was killed in battle. Now, on the eve of her seventeenth birthday, Fallon is eager to follow in her sister’s footsteps and earn her place in the fearsome Cantii war band. She never gets the chance. Fallon is captured and sold to an elite training school for female gladiators—owned by none other than Julius Caesar. In a cruel twist of fate, the man who destroyed Fallon’s family might be her only hope of survival. Now Fallon must overcome vicious rivalries and deadly fights—in and out of the arena. And perhaps the most dangerous threat of all: her forbidden yet irresistible feelings for Cai, a young Roman soldier. This was another one of my $3 hardcover finds at the HarperCollins Canada booth. I have wanted to read this book ever since before it was published. 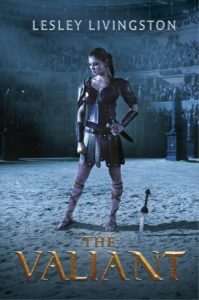 A female Celtic warrior turned gladiator?!? Of course I had to pick this up even though it technically isn’t a sequel and the author wasn’t doing a signing but I really wanted this one so I gave in to my inner book dragon. I haven’t heard too much about this series but from what I have heard people liked it. Yet another $3 hardcover find from HarperCollins Canada. I had grabbed the first book in this series so of course I had to grab the sequel! I was so thrilled when I saw both of the books in this series on the table and both hardcovers to boot. These books have such stunning covers and I love any series that involves the Ancient Celts (it’s my Irish heritage in me lol). And now that I have both of the books in the series I can binge read them both in time for the final book that comes out next year. I have been on a major thriller kick when it comes to books, movies, everything! And this book reminded me of another book I loved, All-American Girl by Meg Cabot. Although this sounds like the thriller and action continues throughout the entire book instead just at the beginning like All-American Girl. 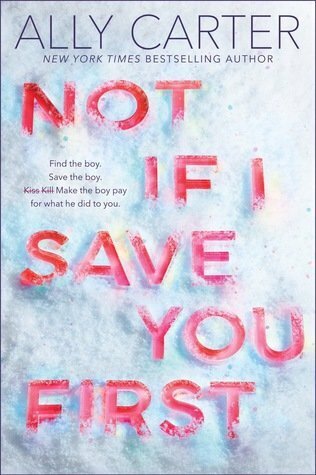 I must admit that I am always drawn to the enemies to lovers trope and this book just sounds so badass with the girls doing the saving. I’m looking forward to this funny action filled and hopefully swoon book! I already had the first book in this series and although I hadn’t read it yet Sarah was there for a panel and a signing so I picked this book up for like 30% off the cover price. I got her to sign both of the books and we had a lovely conversation about anime and Cardcaptor Sakura (any other fans out there?). 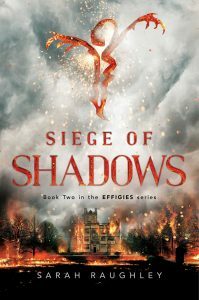 This is the second book in the Effigies series and lets start off by just staring at this stunning cover! I love the idea that these girls who have such awesome powers are celebrities and still have to deal with the press even when they are saving the world. It sounds like such unique premise that I am hoping to get to these as soon as possible especially since the third book is now out so I can read them all in one go. I was just about to head out when I thought I would make one more pass at the cheap section of the HCC booth… And lo and behold I found the final book in my haul! 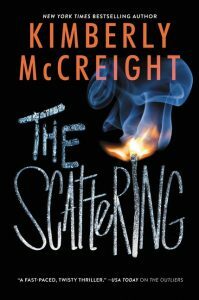 I read the first book in this series a long time ago and I don’t know why I didn’t continue because I absolutely adored the first book. It was a mystery thriller which ended up being kind of like a teenage x-men. I just realized that I never reviewed it on my blog so I feel like a re-read of The Outliers (book #1) is in order. From what I remember book #1 ended on a pretty big cliffhanger so at least I can continue the series immediately. 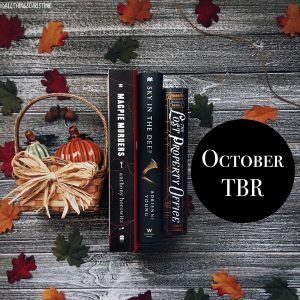 This would make a great fall read too! I only bought 8 books! That’s got to be a record or something, right? I was so tempted but I really held myself back and I am really proud that I managed to. There’s so many books I have yet to read and review that it has kind of gotten out of control. 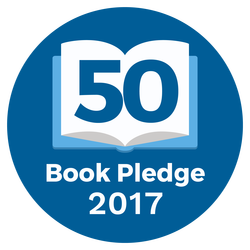 I have piles of books in my closet, every bookshelf is stuffed full with two layers of books per shelf… So I am thinking of starting something called Project Book Backlog. I will let you guys know what I do with that later. So have you read any of these books? 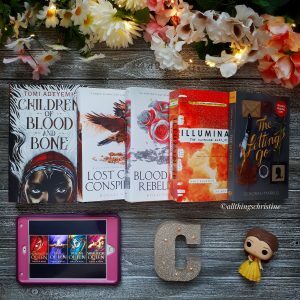 Are they on your TBR? Let’s talk about them in the comments down below. That looks like a great selection. Not If I save You First looks great. 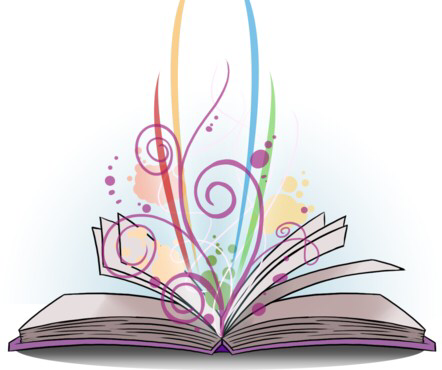 Your books all look fabulous. Sounds like you had fun. 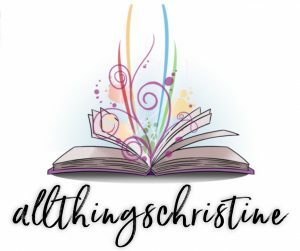 Some great sounding books in your book haul. That is QUITE the haul! These are all new to me, so thanks for sharing. your books all look amazing. Great selections! A few of these caught my eye! 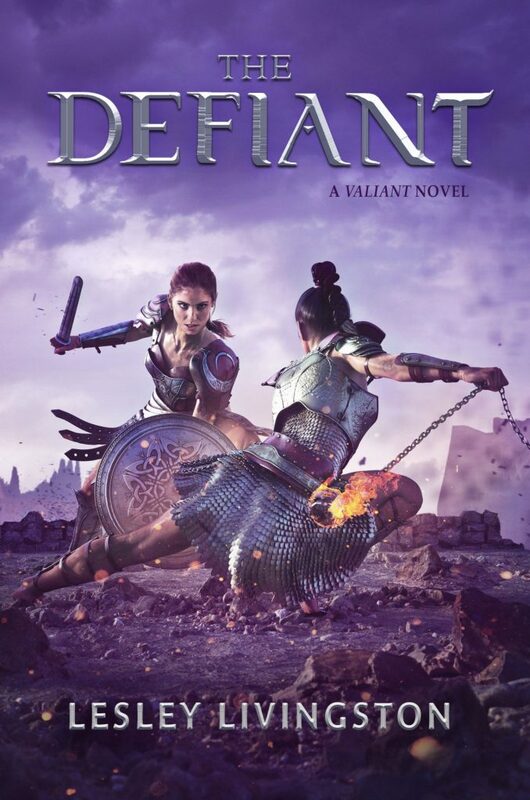 Ohh great book haul I absolutely love, love, love The Valiant by Lesley Livingston I haven’t read the second book yet but I didn’t know that the author was going to do a third book Ugh I really need to catch up on that book series and hopefully I can do that soon! 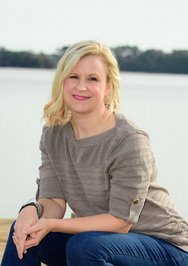 Thank you so much for sharing your awesome post.